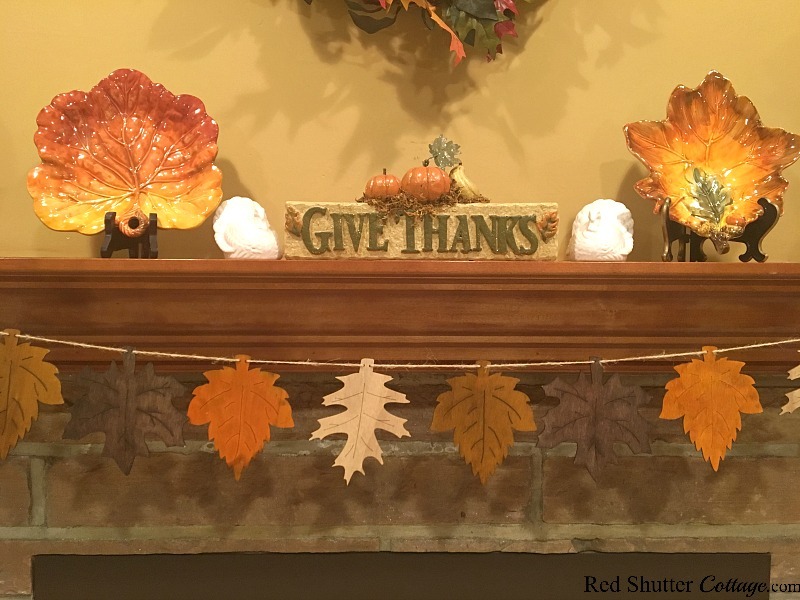 Thanksgiving deserves its own mantel, don’t you think? 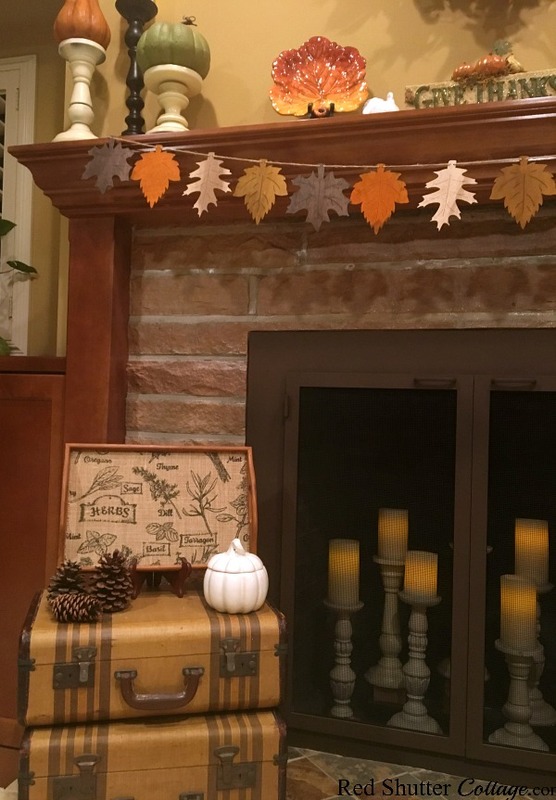 Halloween gets plenty of mantel focus, and Christmas certainly inspires and dazzles with mantel ideas. But in November, the crazy month transitioning from Halloween to Christmas, sometimes Thanksgiving gets a teensy bit overlooked. 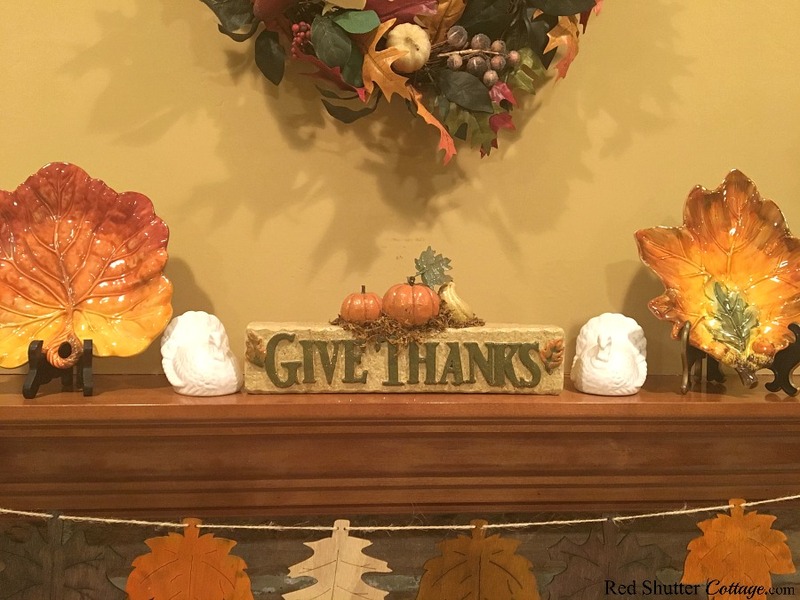 So let’s give Thanksgiving a mantel it deserves. 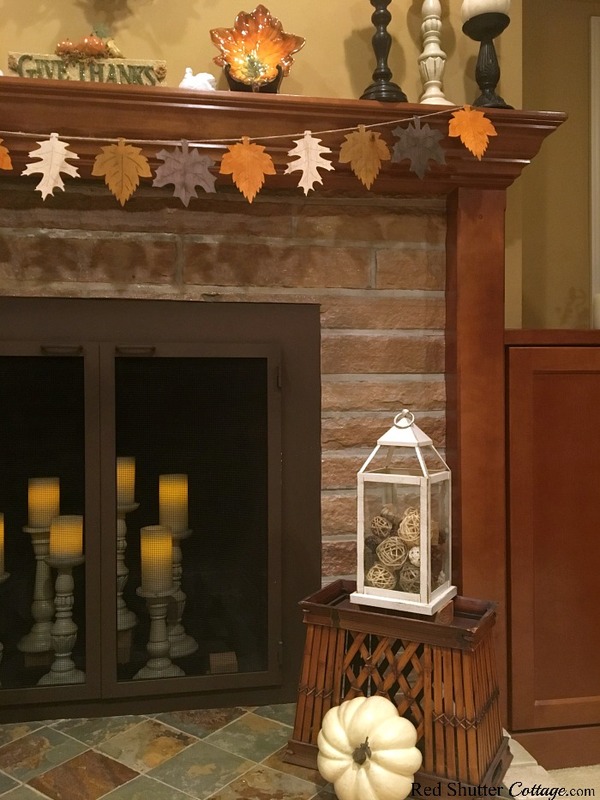 I found this leaf banner at Michael’s at 50% off. I wasn’t even sure I would like it, but at that price it didn’t really matter. When I opened the package, I was happily surprised to find these leaves are made from something stronger than card stock. They might be made from wood (not sure), but they are sturdy and seem to be strong enough to hold up for a few years. And the colors are perfect – muted brown, orange and taupe. 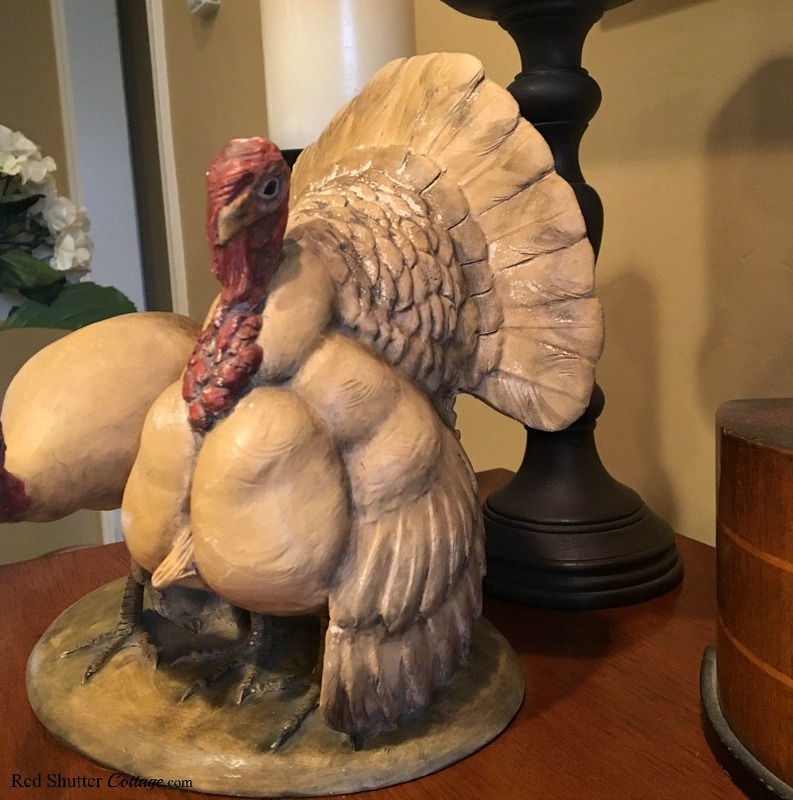 That’s it for new purchases made for my Thanksgiving mantel. Everything else is part of my “fall inventory”! 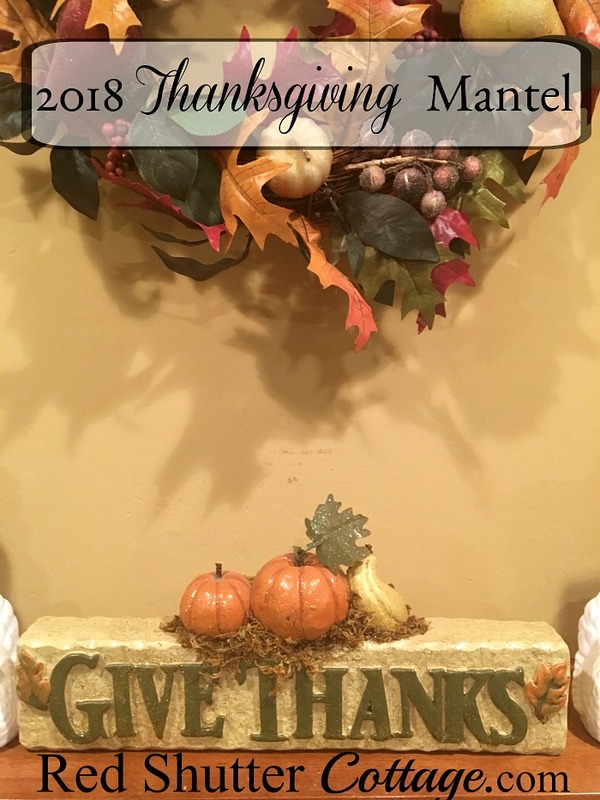 I have had this “Give Thanks” little plaque for several years. I like how simple and classic it is. 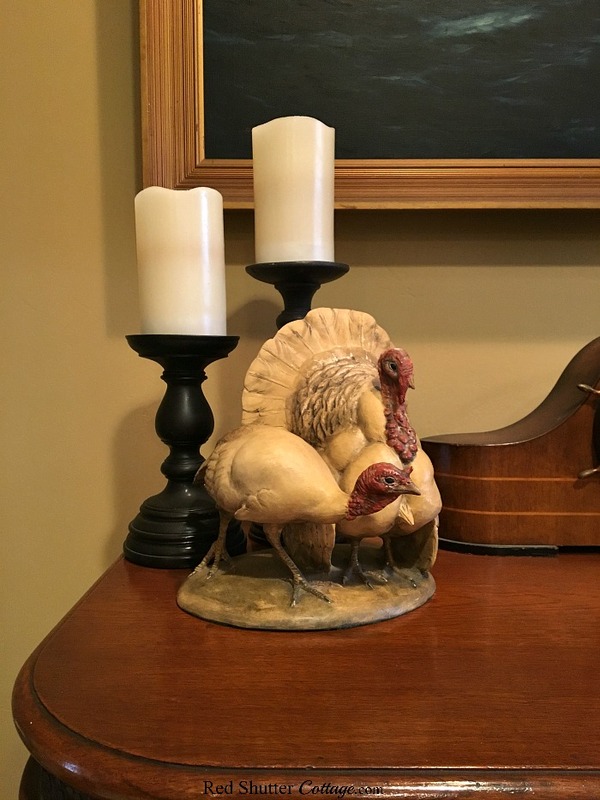 The white ceramic turkeys came from Sur la Table; not surprisingly, they are actually salt and pepper shakers. 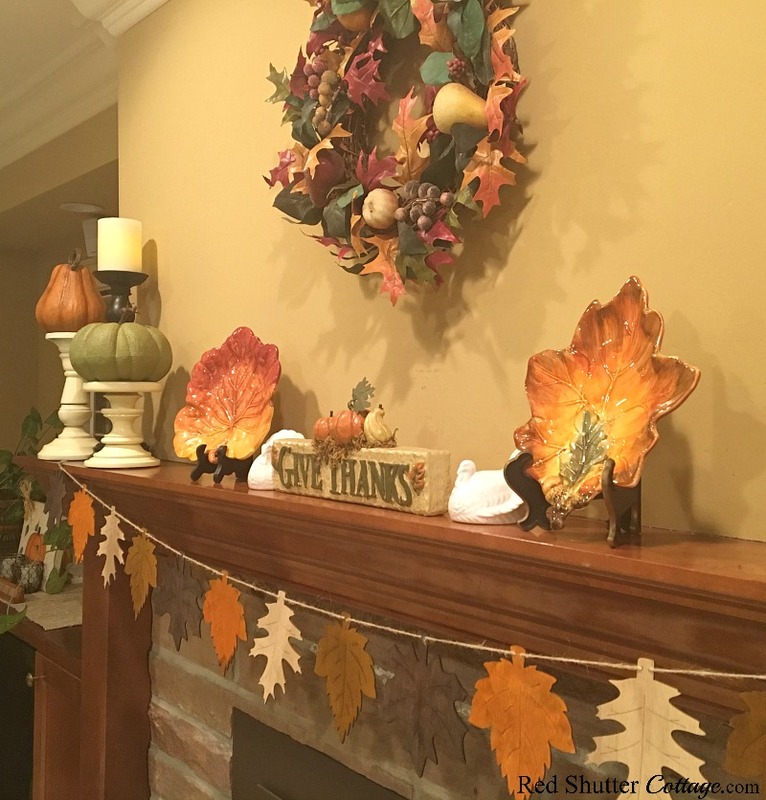 The flanking ‘leaf plates’ are from Home Goods; this is the first time I have brought them out to use on the mantel. And the wreath I have had forever….but I still love the color combination of the gold, green and burgundy. 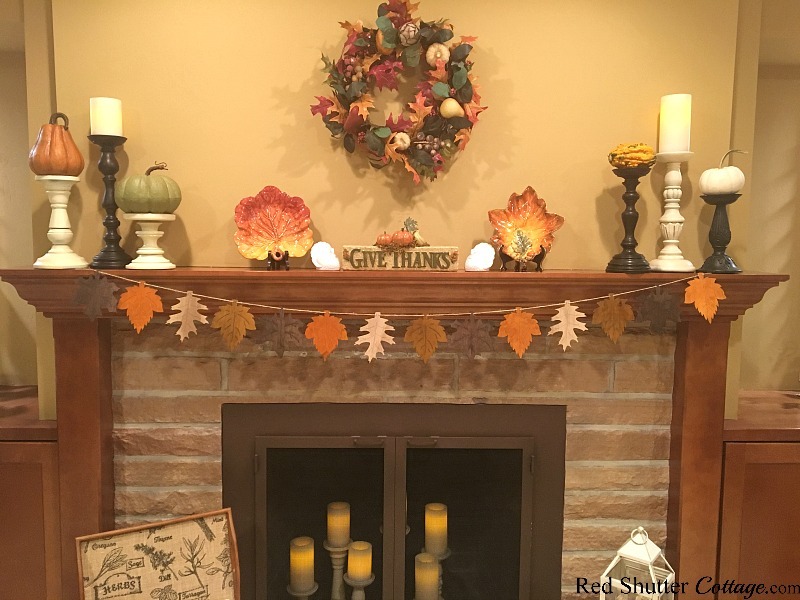 On either side of the mantel, I kept it simple. 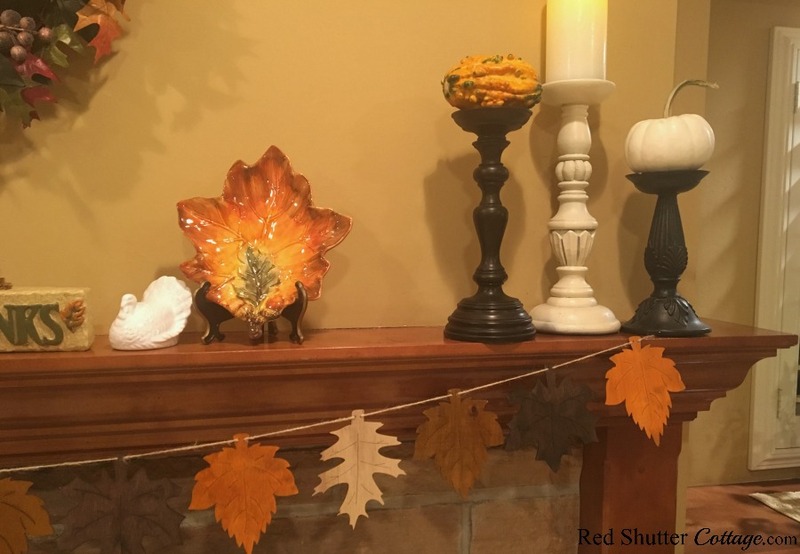 Just candleholders topped with pumpkins, gourds or candles. 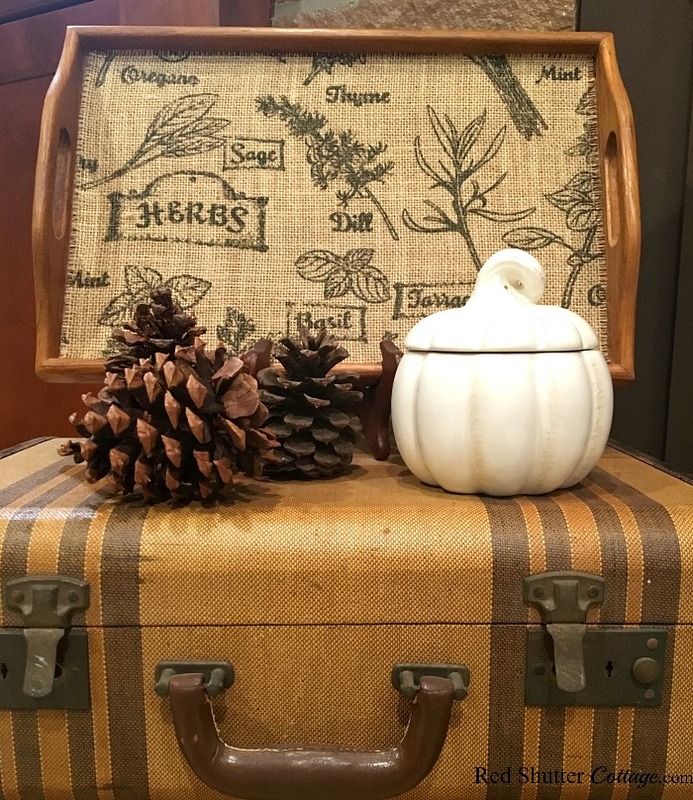 On the left side of the hearth is my ‘herb’ tray accompanied by some pinecones and a white ceramic pumpkin (triple mark-down from Sur la Table). And on the right, a Pier 1 lantern filled with willow balls, pinecones, and wine corks. 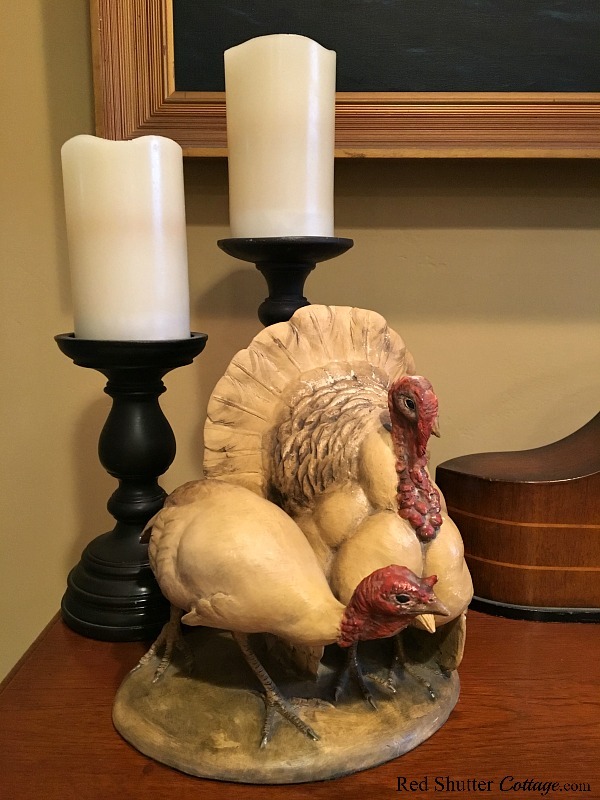 My favorite Thanksgiving decoration is this pair of turkeys. My mother always put them out for Thanksgiving, and I still find them beautiful and special. 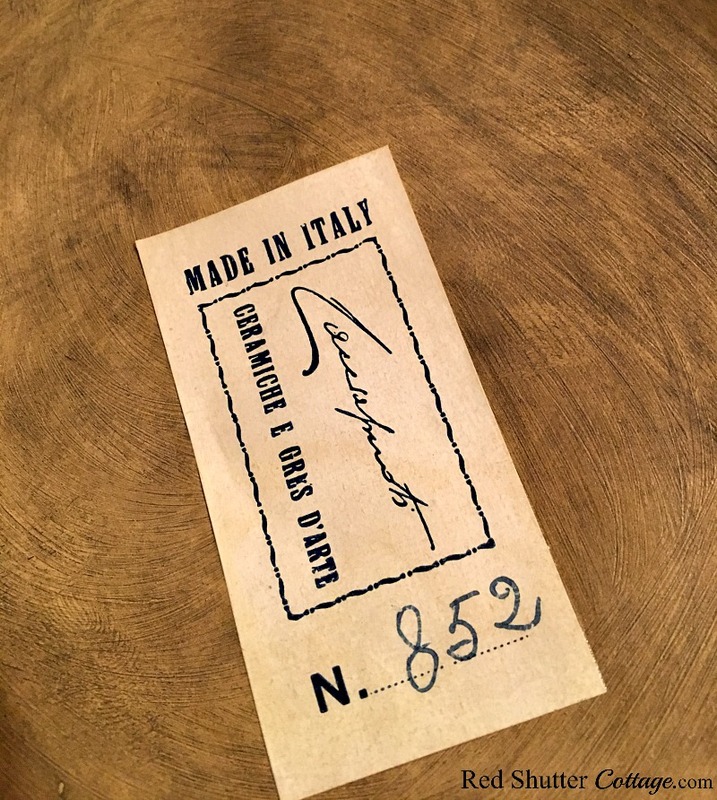 There is a label on the bottom with the name of the artist, and the company (both from Italy) and a hand-written number. 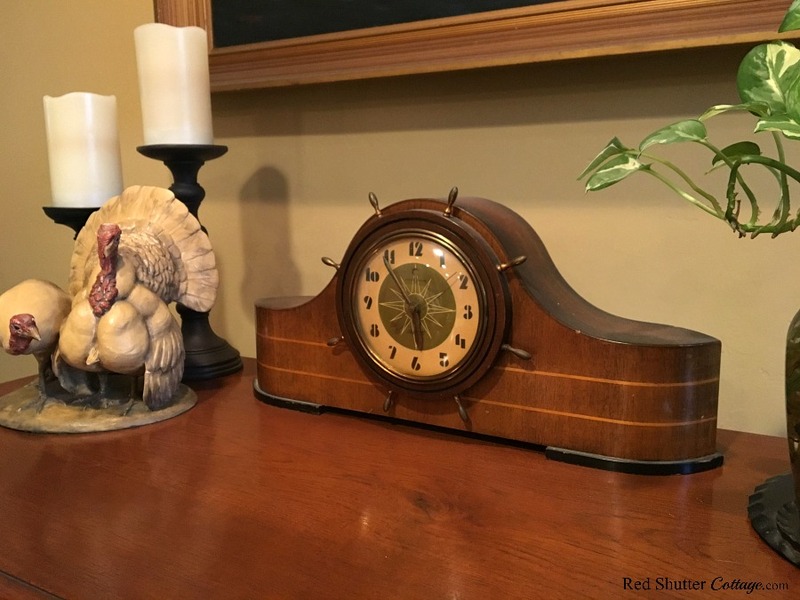 From what I was able to find on Google, I think these turkeys date back to the 1930s. Regardless, their value is in how much I love them, and how they bring a part of my childhood to our Thanksgiving celebration. 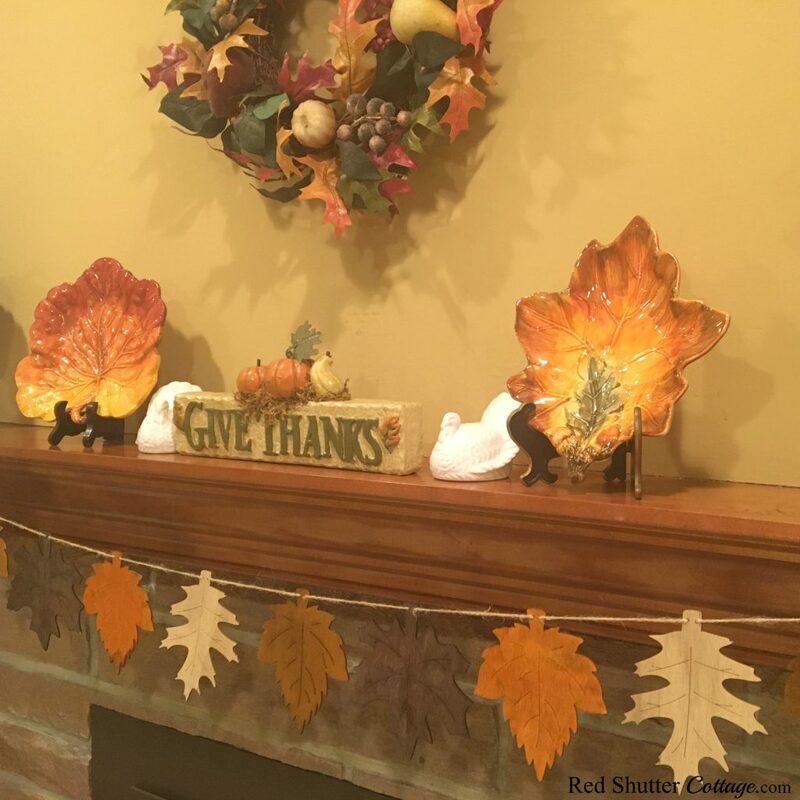 Thank you Nancy – hope you all have a wonderful Thanksgiving! 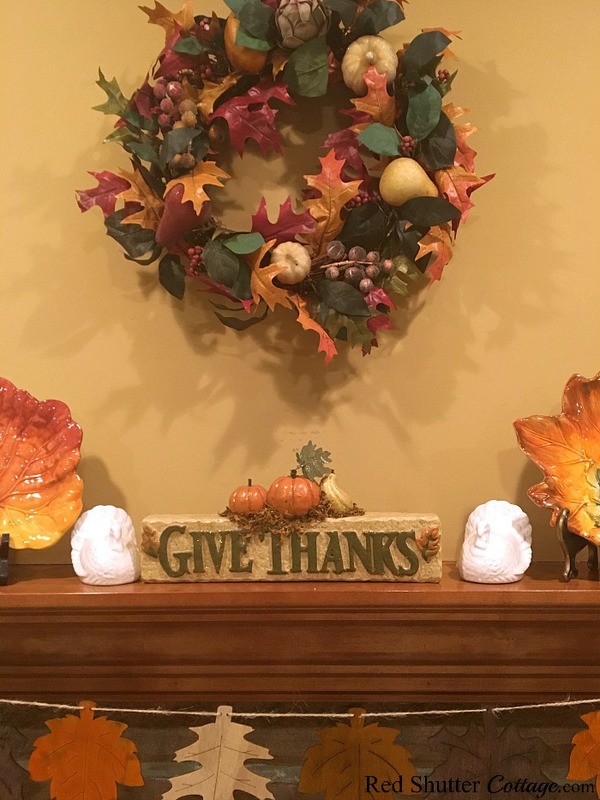 What a lovely Thanksgiving mantel. Happy Thanksgiving. Thanks for sharing at the Snickerdoodle Create Bake Make Party. Thank you Debra!! I am so enjoying being part of the Snickerdoodle Create Bake Make Party and I am looking forward to continuing to being part of it in 2019! Liberty – Thank you for stopping by, and thank you for your very kind invitation! 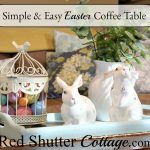 Sweet Pea and Calypso in the Country are blogs that I very much enjoy reading! I am excited to join your “Best of the Weekend”link party-you will see me next week!